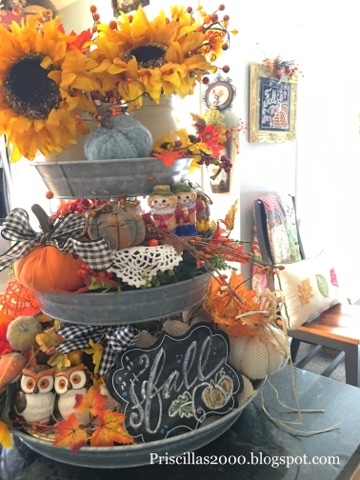 It's time for this years galvanized tiered tray decorated for Fall! 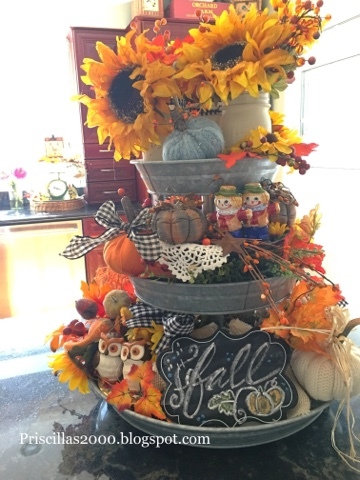 Sunflowers ,Fall berries and fall leaves fill Mason Jars on the top tier..
Sweater pumpkins, a mini chalkboard, and cute salt and pepper shakers ..
All things Fall just tucked in the tray! 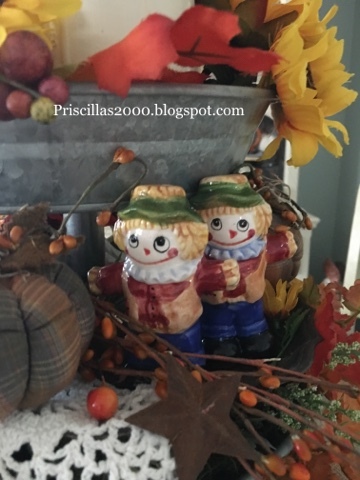 I found these scarecrow salt and pepper shakers at the Goodwill for 50 cents this year .. love them .. 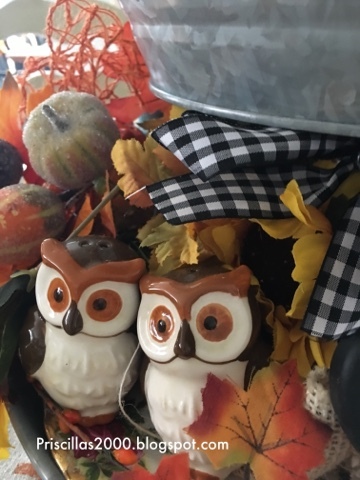 These owl salt and pepper shakers are from BHG at Walmart a few years ago.. haven't seen any out this year yet ..The kitchen is just bursting with the pretty colors of Fall .. I love this! And what a great GoodWill find! 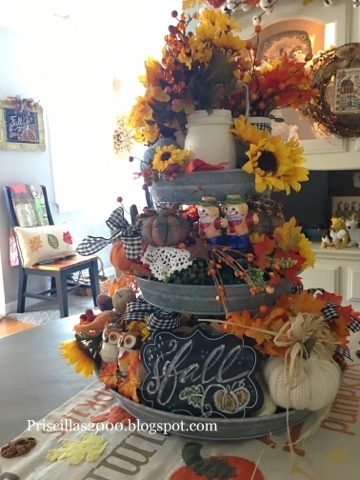 Ill be decorating for fall soon! So cute! I'm trying to find time to visit the thrift stores in town; I think there are three of them now, all within a few minutes of each other. 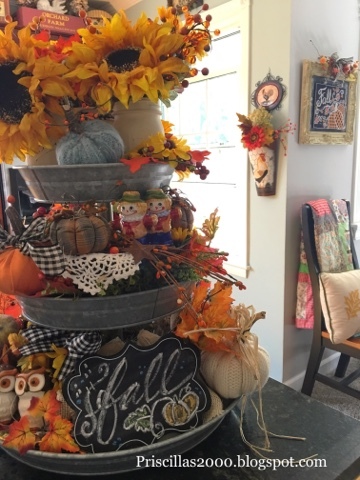 I wish you could do a video walk through of your home! Wonderful Autumnal sight. Love the salt and pepper shakers. 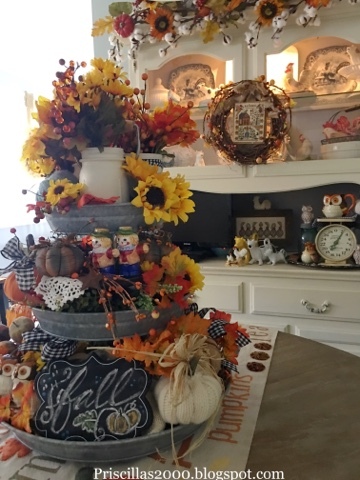 I have an old cream jumper that can be cut up to make pumpkins.Will look at making a couple. It is Spring here in N.Z. now, today is awful, wet,wet,wet, and cold also windy. Stitching day today with no guilt. 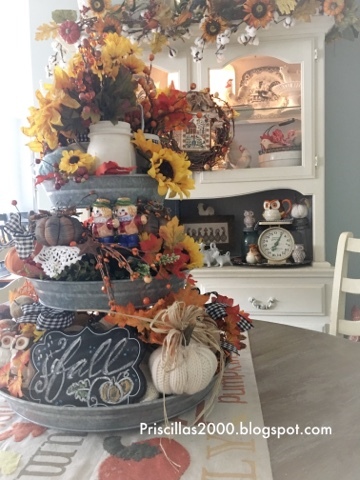 Absolutely adore the galvanized tiered server and the way you have it dressed for Fall!